Marion Finlayson’s last catwalk appearance may have been over 60 years ago, but she looked as though she’d never been away as she made a triumphant return to the runway at the age of 80. 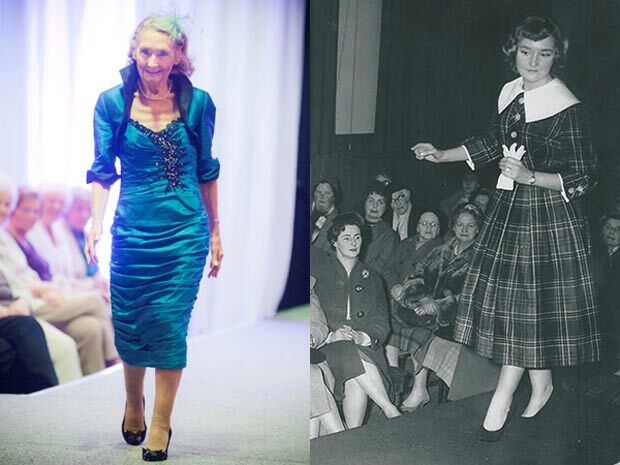 The glamorous grandmother, who first modelled when she was a teenager before pursuing a career as a teacher, went down a storm at the launch of the 50 Plus Festival in Aberdeen earlier this week. Marion Finlayson says she is enjoying the experience a great deal more the second time around as she has grown more confident over the years. “I thoroughly enjoyed it,” she said. “I hadn’t done it since I was a student in the late 1940s. Luckily I don’t have nerves anymore so I just got up there and had lots of fun. Marion Finlayson, who is grandmother to Antonia, 13, and Andrew, 11, previously worked as a teacher at Albyn School in Aberdeen for years and went on to work with special needs children. She decided to return to modelling after the death of her husband Bruce in 2010 and says having something else to focus on is helping her to deal with her grief. “My husband, Bruce, died a year and a half ago after 54 years of marriage, a very good marriage, and I found it very difficult to overcome it,” she explained. “But doing this catwalk has really helped. I’ve got to meet lots of new, younger people, which I think is good for me. The widow says her family and friends have also played a huge part in helping her to move on after losing her beloved husband, and reveals that she recently found the strength to go on holiday alone. “I used to go on holiday to Italy a lot with my husband, and I wasn’t sure about going away on my own,” she says. Marion Finlayson, who is incredibly great shape for her age, says she likes to keep active and regularly attends yoga and Pilates classes. “I do yoga, pilates and tums and bums classes every week,” she says. “My grandchildren are a handful as well, they’re always running about. “The modelling was something different and I would definitely do it again. If anyone asks me I will have a go – it’s better than doing the ironing.